An injured snowboarder was dug out of the snow by his companion after he was caught in an avalanche on Ben Lomond near Queenstown yesterday. The 30-year-old man was partly buried after falling about 200m down a steep slope on the 1748m peak about 11am. He was plucked from the mountain by a helicopter long-line in a rescue mission carried out by two Lakes District Air Rescue Trust choppers. He was taken to Lakes District Hospital in Frankton with injuries described as moderate to serious. 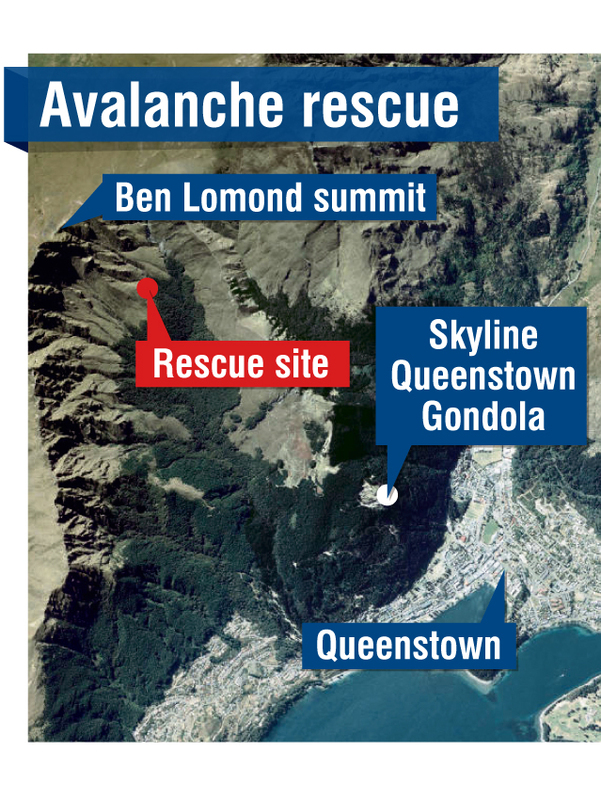 Queenstown SAR co-ordinator Constable Julian Cahill said the two Queenstown residents were ski-touring on the southeastern side of the mountain when one fell. The man, who was on a splitboard - a snowboard which can be separated into two ski-like parts - then tumbled down the steep face and was partly buried in snow. After digging him out, his friend called 111. Const Cahill said he was unsure whether the injured man triggered the avalanche, but he was "very lucky". "If he had gone over a bluff and tonked his head, he would be dead." He was suffering from severe chest pain. The "long, narrow" avalanche, which occurred about 400m below the summit, was about 200m long. Heliworks pilot Kurt Schierning said he and the pilot of the second chopper, Scott Dwyer, had to carry out "one-skid unloads" - where one skid rests on the slope - near the injured man because it was too steep to land. The man, who was in "agony", was extracted using a long-line and flown across to Ben Lomond Saddle to be loaded into the helicopter. The other helicopter had earlier dropped a paramedic and two ski patrollers from Coronet Peak ski area near the two men. Mr Schierning said there were "nice flying conditions" at the time, which had made the rescue straightforward. Const Cahill said incidents on Ben Lomond made up the majority of the work for search and rescue personnel in the Wakatipu. There had been three significant rescues on the mountain in the past year involving lost walkers or climbers. Although the track to the summit was popular with day walkers, those who deviated from the track could find themselves in extremely steep and hazardous terrain, he said.